Deaton, a communication major from Indianapolis, created the video as part of a series of stories about the Goshen community. The videos were released online on Goshen Commons, a local news blog site published in collaboration with the Goshen College Communication Department. “Made in Goshen” tells the story of The Local, a retail space run by six local craftsmen and artists from the Goshen area. It received a bronze Telly in the category of Online Video/News Feature. Deaton created the video herself from the top down, including writing, interviewing, shooting and editing the project, under the supervision of FiveCore Media General Manager Kyle Hufford. The Telly Awards is a national competition designed to honor commercials, video, film productions and work created for the web from professional advertising companies. The Telly Awards receive approximately 13,000 submissions nationwide each year and 20% of the entries receive a Bronze Telly, second only to the Silver Telly Award, which is the highest honor. Deaton will receive a Bronze Telly statue with her name on it, designed by the same firm that makes the Oscar and Emmy statues. This is the fifth Telly Award earned by a Goshen College student or team. 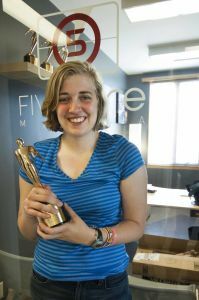 FiveCore Media is a video production company located in Goshen comprised of creative professionals and a group of gifted Goshen College communication students. FiveCore Media writes, produces and edits videos including commercials, promotional and informational videos. For media inquiries or to learn more about FiveCore Media, visit their website at FiveCoreMedia.com or contact Kyle Hufford at 574-535-7192 or email khufford@goshen.edu.